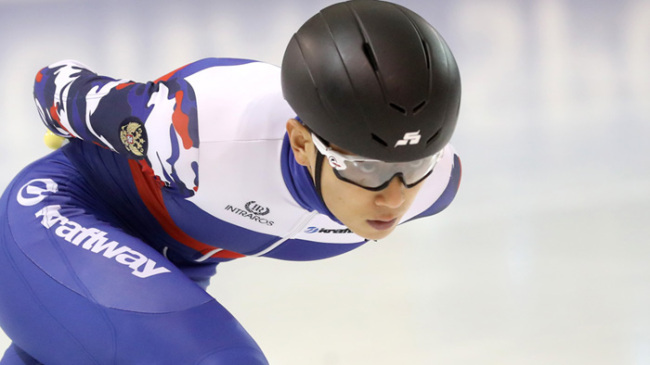 Russia’s Viktor Ahn, one of most decorated Olympic short track speedskaters, expressed strong dissatisfaction over the International Olympic Committee’s recent decision to bar him from competing at the 2018 PyeongChang Winter Games in his native South Korea, according to Russia’s local broadcasting company Match TV on Wednesday. The six-time Olympic champion, 32, Tuesday left the team meeting room without a word, shortly after he heard that the IOC excluded him from the list of Winter Games participants, just less than three weeks before the start of the event, according to the report. The list that excluded Ahn and his teammates Denis Airapetyan and Vladimir Grigoryev is part of the World Anti-Doping Agency’s investigation into alleged state-sponsored doping among Russian athletes ahead of the Games. The list, however, did not include reasons for Ahn’s exclusion from the participation. Born in South Korea, Ahn won three Olympic gold medals at the 2006 Turin Games for his native country, but became a Russian citizen in 2011 after yearlong injuries and conflicts with the Korean Skating Union. In 2014, Ahn won three golds and a bronze at the Sochi Olympics.